Since its arrival at Venus in 2006, Venus Express had been on an elliptical 24‑hour orbit, traveling 66 000 km above the south pole at its furthest point and to within 200 km over the north pole on its closest approach, conducting a detailed study of the planet and its atmosphere. When travelling above the clouds, airplane passengers sometimes witness a glory: a light phenomenon similar to a ring-shaped rainbow. Droplets in the clouds back-scattering the sunlight are responsible for this appearance. A team of scientists led by the Max Planck Institute for Solar System Research (MPS) in Göttingen have now fully imaged a glory on Venus – and thus for the first time on a planet other than Earth. 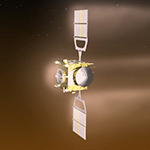 The data was obtained by ESA’s space probe Venus Express. The data imply that the sulfuric acid in Venus’ cloud tops could additionally contain pure sulfur or iron chloride – and may help solve one of the oldest mysteries of Venus research. The veil of clouds surrounding Venus is as beautiful as it is hostile to life. Sulfuric acid constitutes their main component. Together with the planet’s dense atmosphere composed mainly of carbon dioxide, this cloud cover causes Venus’ extreme greenhouse effect. Temperatures of more than 400 degrees Celsius are common on the planet’s surface. The exact composition of the creamy-yellow clouds is still unclear. Almost 90 years ago, ground-based observations had shown that these clouds “swallow” ultraviolet light of certain wavelengths. Sulfuric acid alone cannot be responsible for this effect. The new panoramic mosaic of the majestic Saturn system taken by NASA’s Cassini spacecraft, which shows the view as it would be seen by human eyes, was unveiled at the Newseum in Washington on Tuesday. 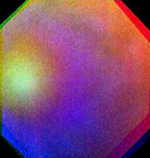 Cassini’s imaging team processed 141 wide-angle images to create the panorama. The image sweeps 404,880 miles (651,591 kilometers) across Saturn and its inner ring system, including all of Saturn’s rings out to the E ring, which is Saturn’s second outermost ring. For perspective, the distance between Earth and our moon would fit comfortably inside the span of the E ring. Start looking for the pair about 30 minutes after sunset. The farther south and east you are in North America, the closer they’ll appear. From locations along the East Coast, the they’ll be only about 1½° apart — about the width of your index finger at arm’s length. By the time darkness falls on the West Coast, the Moon will have edged slightly farther away. As the closest planet to Earth, Venus is a relatively easy object to observe. However, many mysteries remain, not least the super-rotation of Venus’ atmosphere, which enables high altitude winds to circle the planet in only four days. Now images of cloud features sent back by ESA’s Venus Express orbiter have revealed that these remarkably rapid winds are becoming even faster. Similar in size to Earth, Venus has an extremely dense, carbon-dioxide-rich atmosphere and the planet’s surface is completely hidden by a blanket of bland, yellowish cloud. Only at ultraviolet wavelengths (and to a lesser extent in the infrared) do striking cloud streaks and individual cells emerge, due to the presence of some unknown UV absorber in the cloud deck.